That kiddo peeking over your shoulder every time you break out a crochet hook can join you in crafting after some lessons in the basics. With just a little patience, you can be the one to help give your young student those skills and a creative outlet. You don't need much to get started, and you can begin teaching kids crochet skills as soon as they've learned to grip a pencil. 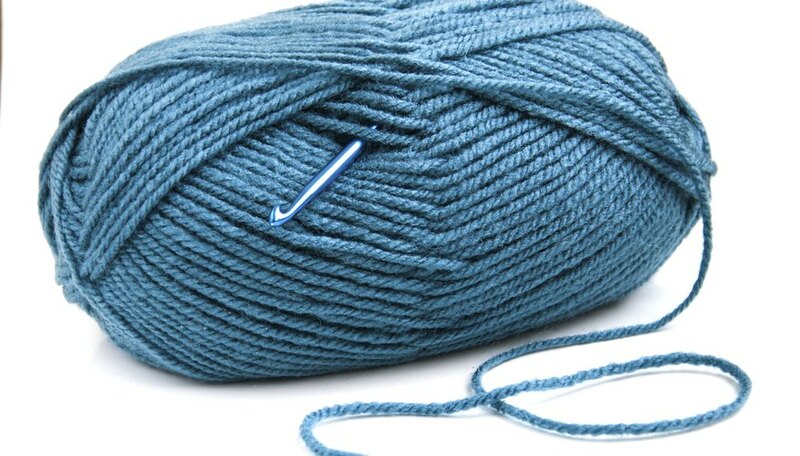 Tips: A size H or I crochet hook goes well with worsted-weight yarn, but it's also a nice size for learning because it's similar to the size of a pencil. Worsted-weight yarn is not bulky yet not thin. Acrylic is the least expensive. A light color of yarn will help kids see the stitches more clearly. * When choosing scissors, find a pair that's sharp enough to cut yarn but safe enough for kids to use. The great thing about crochet is that as soon as you learn the basics, you can crochet just about any stitch. First, show kids how to hold the crochet hook. One of the best methods for this is to start with the pencil hold. It's the one kids are probably the most comfortable with, because they're often holding a pencil at school. Another option is the knife grip, where students hold the hook as if they're holding a dinner knife. As kids become comfortable with single crochet and the foundation chain, show them other stitches, like slip stitch, double crochet and treble crochet. Explain how they are similar and different from single crochet. Start kids off by teaching them good habits right from the start. For example, show them how to hold the yarn wrapped around their fingers to get an even tension as they crochet. Good habits will benefit them as they advance into more difficult projects. Let kids in on the creative process. Things like choosing a yarn color, choosing the number of stitches to chain and even choosing the color for the hook will help kids feel like they're making important creative decisions. Kids benefit from many different types of visuals, so give them as many as you can. If showing them the stitch doesn't seem to be helping, show them images and videos instead. Place your hands over the child's hands and guide her through that all-important wrap and pull of the hook. Take frequent breaks if kids are becoming frustrated. The most important part about teaching kids to crochet is to be patient. Keep those encouraging words coming, even if kids seem upset. When working with someone who doesn't have the same dominant hand as you, sit across from the student rather than next to the student. If kids lose interest the first time around, don't give up. After all, it's never too late to become a crocheter. Gauge swatch: Gauge swatches are a good opportunity to perfect pattern stitches before students begin a new project. Not only will the swatch ensure that their stitches are right, but it will also teach them the importance of making a swatch for each new project they begin. Blankets: Blankets are useful for beginners because the work is repetitive. Plus, perfect stitches and gauge don't exactly matter. Help students decide on the size of the blanket, and then guide them through chaining and completing the first few rows. Having a project goal will help students feel like they're working toward something, rather than just aimlessly stitching. See [How to Single Crochet Blankets for Beginners] (http://www.ehow.com/how_4855767_single-crochet-blankets-beginners.html) for more inspiration. After kids have completed the blanket, you can show them how to add a border. Scarves: Most crocheters' first project is a scarf because it's small and doesn't take too long to complete. Encourage beginners to test out different stitches throughout the scarf, designing their own creation. Granny squares: Granny squares are fun no matter your skill level. Show kids the basic of granny squares, and then encourage them to try new things -- changing colors, incorporating different stitches -- as they advance. After they've crocheted enough squares, you can show them how to seam the squares together. Kids can use these skills to stitch an array of other projects, including any type of in-the-round crochet pattern. Reading a pattern: Some kids may be interested in all the fun crochet magazines and free crochet patterns on the web. Show them the basics of reading a pattern, focusing on abbreviations and where to find the gauge, supplies and other important information. Ashley Little is a craft writer and editor who lives in the mountains of Asheville, North Carolina. Little is the author of Chunky Knits and a writer for Craftsy.com. She has her hands in all kinds of crafts, from sewing to knitting, crochet and any other DIY project she can find.